ISIS Could Reclaim Large Territory In Syria Within Few Months Without US Military Pressure: MSM 1 out of 5 based on 3 ratings. 3 user reviews. ISIS could reclaim large territory in Syria in just months without military pressure, according to a draft report from the US Department of Defense, unnamed US officials cited by NBC claim. The Defense Department Inspector General’s report is to be released in the week between February 4th and 10th. Without military pressure from the US, ISIS could regain a significant amount of territory within 6 to 12 months. Allegedly, the report covers the three months from October 1st to December 31st, 2018. President Donald Trump announced on December 19th that the U.S. military would be leaving Syria. On January 29th, the Acting Secretary of Defense Patrick Shanahan claimed that ISIS is close to being defeated, but there is still work to be done. Inside Syria, he said, “99.5 percent plus” of territory controlled by ISIS just two years ago has been returned to the Syrians. “And within a couple of weeks, it’ll be 100 percent,” he added. Also on January 29th, US Intelligence chiefs gave testimony before Congress. In direct contradiction to Trump they said that ISIS was still very much a threat. So it appears that Trump still claims that ISIS is defeated. There also appears to be some resistance from his aides and reports in the media are trying to propagate a narrative to keep US forces in war-torn Syria indefinitely. when isis came out, the west, in agreement with israel, allowed it to expand with the aim to remove Assad. this time they’ll get a bomb on their heads for every step they’ll take from Syrian and allied forces. Usa took care of ISIS financing? When they us bomb the miles long tanker convoy? Oh wait they didnt, they didnt want to shoot the isis truck driver…or was it not to spill oil in the environment. I remember now, russia showed up in october 2015 and anhilated these tanker convoys. Just go…we got this thanks. (thanks israel) and wants back into the fray again, which israel would welcome and provide guns and explosives and a hospital free card, but not in any serious number so they can be ignored. So how many Daesh fighters are left in Syria? 5,000? 10,000? 50,000? 100,000? I’m assuming there would have to be a substantial amount in order for them to successfully ‘reclaim large territory’? Thats a relative. You forget how many and few troops their enemies has as availible. Unless both the SAA and SDF rapidly withdraw I can’t see ISIS reclaim much of their lands again. The only reason they were able to do so to begin with was because the Western sponsored civil war had weakened the SAA so much it could no longer hold on to them. In contrast the SAA is currently in the best shape its been since the war started and the Western backed Jihadis have been pushed back into the Idlib Jihadi reservation. That only leaves a rapid SDF withdrawal. Well, if Turks attavked Kurds in North. Then what. If Assads collapsed in Idlibe, then what. If the Iraqian jig saq puzzle went down – then what. Is there a point to your point? The headline is just ludicrous propaganda. ISIS ain’t returning to establish a caliphate in Syria for another million years! It behooves the reader to discern what is fantasy and what is reality when it comes to current ISISian power. Nothing wrong in being worried. A lot can suddenly happen in that little corner of the world and ISIS still are in dots several other places in the world. I already told you guys Putin poured gasoline all over ME, and US cleaned Syria for terrorists while Assad and Putin were busy bombing Syrian civilians who wanted freedom. If US Special Forces 2000 pull out, all Syria will completely collapse and quickly turn into a terrorist sh.thole all over the place. Erdogan will make genocide against the Kurds, Assad will bomb civilians with chemical weapons, and Putin will make lucrative oil and drug deals with ISIS. Syria complete chaos. As the land of the free and a human rights leader, we Americans simply cant allow this to happen. Period. ISIS retaking Syria is like Elvis returning from the dead. Never gonna happen. Attacking like mosquito in the night, yeah and getting further squashed. And I advise you to go look at current war maps to see the speck of land ISIS now holds in Syria – and NOT for long. Sorry Lena but perhaps you should get yourself up to date with recent events! ‘Daesh’ have managed to successfully counter attack the SDF in the Euphrates Valley, reclaimed the area back to the Iraq border and have now infiltrated Iraq! Ed, you’ll forgive me but a silly ambush here and there by diminishing terrorist diehards does NOT make for a “reclamation” of territory. 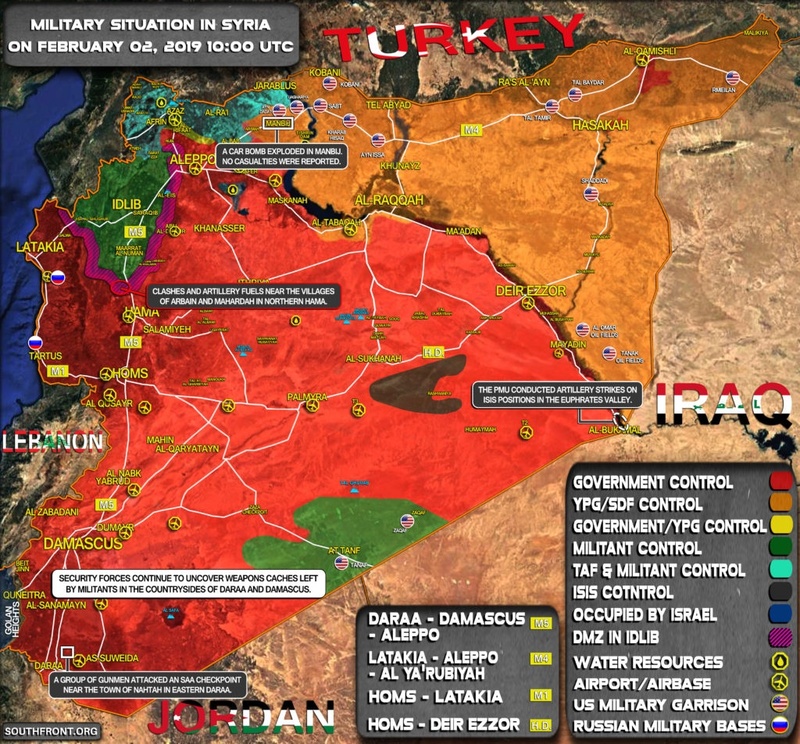 Here’s TODAY’S Syria map (Feb 2nd/2019) status – and as you can see, the ISISian/Daesh (color-coded in black) is shrinking and clearly incapable or reasserting itself again in Syria in the face of insurmountable opposition from Russia, Iran, Syrian, Hezb and Iraqi forces, both governmental and tribal. Plus, funding for the terrorists in Syria is at its lowest ever now and this makes it financially prohibitive for them to expand and keep territory. The map I shared with you is an SF article/map from same date as my comment: ie, from yesterday. I maintain that ambushes and skirmishes do not a ‘recovery’ make. ALL foreign invaders will eventually either leave Syria willingly, or get captured and imprisoned/evicted from the country, or else they stupidly die fighting a lost war. I admire your optimism but I really don’t think they will ever be defeated! Even if they are defeated in Syria, they may somehow re-emerge. Or they’ll just grow stronger in other countries. Look what is currently happening in Nigeria. They seem to be attacking and gaining more ground on a daily basis and all the Nigerian army is doing is running away! As far as Russia be in Syria helping it (instead of Turkey), there is not way for this to happen. If USA-Israel-NATO re-arm terrorists, Russia will destroy them immediately. Russia intelligence is good enough to know most of the USA, Israel and NATO plans and motions. Confusion reigns in the White House and in the MSM. President Bolton wants the US to stay in Syria so he feeds the media this kind of junk and they happily print it. His junior partner, Trump, disagrees. There is plenty of evidence to support the prediction that the SAA and its allies that will regain large swaths of territory when the US leaves. From weapons, training, occupation and bombing raids, the US has been a good friend to ISIS and visa versa. Its the worst case version if everything goes their way. As long as troops reamin bound and more and more of them gets more and more exhausted in Iraq as well, people like ISIS can regain some in that vakkuum. B.S when ISIS orginally expanded they did not have Russia, Iran, Iraq, Hezbollah and the Syrian Army hunting them down…not only that Trump ended covert arms deals to the Syrian opposition (ISIS ) in July of 2017 ..though likely the out of control CIA found a way to ignore that order. The LGBTQI dominated US/Israeli deep state has one major goal, destroy Putin. The proposed Saudi/Qatari gas pipeline into the EU was the deep states first attempt to destroy the Russian economy, when Assad refused to go along with their diabolical plan they just tried to take over his country and do it anyway, but due to Putin and Iran cooperating in Syria, that wasn’t what happened. Instead they got a stalemate war that did just as much harm to their own countries, as well as the countries they do business with, and then everybody became a loser. But just like Putin, Trump is also vehemently opposed to the LGBTQI dominated deep state of the US/Israel, he and Putin are both cooperating to bring the them down, they want us all to see who the real puppet masters are, and why they’ve been forcing all these sensless wars on humanity. Putin, Trump and Xi Jinping belong to the old world order, they want to stop the new world order form dominating the whole planet, I no longer think of the US as just the US, or Russia and China as just Russia and China, I see every country has its own struggle with the same problem, internal struggles between those that would bring about the new world order and those that would retain the old world order. So far the New world order has been winning for 80 years, but since Trump’s been in office, things are starting to change, I’ve been seeing just how effective Trump and Putin’s strategy has been, all the deep state operatives are going insane already, some of them have already had to resign and leave office, not because they’re resigning in protest as they always tell us they are, it’s because they can’t tell the truth, something Trumps trying to force them to do but they can’t, telling the truth is what drives the new world orders followers insane the quickest, great job Trumpy, keep up the good work.